The eastern pine elfin is a common elfin in Massachusetts. These small butterflies of spring are found in the vicinity of pines and wild blueberry bushes. Are there elves in Westborough’s woodlands? No, not exactly, but we do have springtime butterflies called elfins. They can hardly be considered mischievous, but they are small, lovely, and well concealed. Showing patterns with subtle colors and rich brown hues, elfins blend in well with their early spring surroundings, which are often just beginning to green up. What makes a brown butterfly special? Many of us think of butterflies as relatively large and dramatic, with bright yellow or orange colors, flitting above the flowers in a summer field, because these are the butterflies that are easy to notice at a time of year when we’re likely to be outside. But elfins are welcome as butterflies of spring, appearing in or near woods from mid-April through June, and their brown colors help them survive at this time of year. Elfins are indeed small – about the size of a grown person’s thumbnail when they perch with wings closed, as they typically do. Their rich brown colors help them hide from predators, such as birds, in spring woods where branches, fallen dead leaves, and dried grasses make brown a dominant color. Their brown colors are also dark enough to help them absorb the warmth of sunlight on chilly spring days as they bask in a sunny spot. How do you find elfins? Like other butterflies, elfins spend time near plants that are important to them either as food plants for their caterpillar stage or as sources of nectar for adult butterflies. 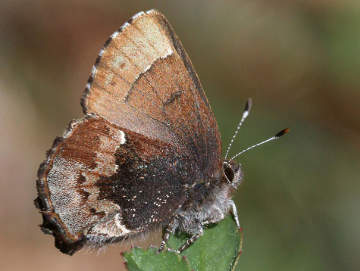 The eastern pine elfin (Callophrys niphon), a common elfin in Massachusetts, is a good example. Its caterpillars feed on pines, including white pines, red pines, Scotch pines, as well as red cedars. All of these trees grow in Westborough. And pine elfins often take nectar at the blossoms of wild blueberry bushes, which grow in many places in Westborough’s woods, especially in mixed woods with both pine and oaks. Blueberries bloom in early May. The eastern pine elfins that you might see now actually hatched from eggs almost a year ago. They spent the first part of their lives as small green caterpillars (their immature form, or larvae) with lengthwise white stripes. Their caterpillars fed on the new growth on pines, and then spent the fall and winter encased in protective brown chrysalises. As the weather warmed this spring, they emerged as butterflies. This spring’s pine elfins are focused on finding mates. Males typically search for females and court them in the afternoon. They usually do this at the tops of pine trees where they’re hard for us to see. Females come to smaller, young pines to lay their pale green eggs, one at a time, on newly grown pine needles – the food supply for the caterpillars that will soon hatch. These butterflies do remember to eat, so they also come to ground level to find nectar and to bask in the sun. Pine elfins are well suited to much of Massachusetts. Their caterpillar food plants are plentiful. White pines and red cedars have sprung up in old agricultural fields over the decades as farmlands reverted to woodlands, starting back in the mid-1800s. Henry’s elfin is a less common elfin, sometimes found near swamps. What about climate change? Research shows that pine elfins are sensitive to temperature around the time that they emerge as butterflies in the spring. In other words, in years when the average temperatures are warmer in March and April, they emerge earlier than in years when the average temperatures are cooler. This ability to respond to temperature can help them adapt to a changing climate. And research indicates that in last 20 years, pine elfins have indeed been emerging earlier in April than they did before that period. 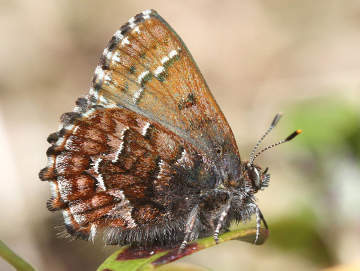 If you watch for pine elfins this spring, you might see another elfin, such as Henry’s elfin (Callophrys henrici). This less-common elfin has different, less bold patterning than the eastern pine elfin. Henry’s elfins also use different food plants for their caterpillars, which feed on the flowers and fruit of various plants, including blueberries and huckleberries. More recently, in Massachusetts their caterpillars have begun to feed on non-native invasive buckthorns (Rhamnus). The edges of swamps are good places for this butterfly, and we have plenty of swamps in Westborough, including Cedar Swamp. If you think you might need some help in looking for small brown butterflies, consider encouraging children to join you. Kids with sharp eyes and youthful curiosity often have fun finding things in the natural world and noticing small differences. (Thankfully, gone are the days when an interest in butterflies meant catching them in nets and pinning them to boards.) Today binoculars and inexpensive digital cameras make it possible and fun for children and adults alike to observe living butterflies first-hand and watch their behavior. And who knows where an appreciation of natural world and a habit of making observations might lead a youngster? Perhaps to an interest in science? While you’re outside, you might also notice some of our other spring butterflies, including small spring azures and eastern tailed blues and large mourning cloaks. And then there are many mid- to large-sized butterflies that begin to appear before summer, including American ladies, painted ladies, black swallowtails, tiger swallowtails, commas, question marks, and fritillaries. Massachusetts has more than 100 butterfly species. Enjoy!